McCarthy, the house chief deputy whip, was plugging his new GOP BlackBerry app. He and another whip launched the app, and I’m fighting the urge to make a “whip it good” pun. I read a press release that expanded on a tweet he made about the app. I’m pretty sure he also made a Facebook post about the tweet about the app. Do all Congress members spend their days tweeting and texting like giddy tweens? McCarthy’s on Twitter, Facebook, and now has his own freakin’ smart phone application. Indeed, he’s a shining star when it comes to how hip the Republican party has become. Yeah, they could’ve developed an iPhone app, or even reached across the electronic aisle and gone multiplatform. This is exclusivity at its finest. They’ve drawn the line and left all the free-boating liberal hippie douches to their carefree handhelds and silhouetted dancing. What it also means is McCarthy and crew have developed an exclusive deal with a private business. Yes, he’s shamelessly marketing a phone application that undoubtedly is plumping the wallets of people associated with BlackBerry. But it means my own dream is slowly becoming a reality. Imagine a world in which politicians proudly wear corporate sponsorships on their sleeves to eliminate the guessing game. I’ve dreamed of a realm where politicians’ suits are decked out like NASCAR drivers with various badges to commemorate the hands in their puppet holes. In my world, every lame campaign commercial ends with: “This congressman has been brought to you by Verizon”—or something to that effect. It would actually be something like Blue Cross. I’m a dreamer. And yes, I’m expecting fat checks from Verizon and NASCAR. Time to suit up to sell out. In the meantime, we’re still left guessing. I don’t want to get too hopeful, but Gov. Arnold Schwarzenegger and Senator Abel Maldonado may soon rekindle their political spooning session. If you’ve been blending episodes of The Hills and Cal-Span lately, you’ll know what I’m talking about. Arnie and Abie were inseparable for a while a few years back. I think Schwarzenegger was the big spoon. They hugged for news crews and pranced about like high school sweethearts to the point of being dubbed Marnoldonado. Then Abel cooled off after Arnold didn’t throw some gubernatorial weight behind him in a controller race—and they went on a break. But now he’s a top contender for the lieutenant governor’s seat. The outgoing John Garamendi has been the ultimate bitchy underling. He and the guv had a mean public spat over offshore drilling and a State Lands Commission brouhaha over drilling off the Tranquillon Ridge. Sure, Abel still has to be approved by a Legislature filled with a mix of Democrats who would be squirming in their seats at the thought of helping him rise farther in his party’s ranks and Republicans who are still bitter since he cast the final vote to raise taxes and pass a state budget. The fact that people are talking about the possibility of Maldonado as an official right-hand man is a sure sign that Marnoldonado is back. Maybe they’ll adopt Assemblyman Sam Blakeslee. Because unlike Garamendi, Blakeslee wants to crack the Tranquillon Ridge. Not quite as tranquil, but more profitable. Blakeslee’s been mailing out pamphlets sponsoring the PROTECT movement: that’s Protecting California’s Coast, Saving State Parks, Creating Local Jobs, and ahem, building a new offshore oil rig. On the district-wide mailer, there’s a picture of a little seedling and a gorgeous stretch of coastline. Mysteriously missing are any oil platforms. Here’s the deal with the project: Oil giant Plains Exploration Company (PXP) wants to build a new offshore platform off the coast of Vandenberg. In exchange they say they’ll decommission four other platforms and pump billions into the state economy. Not bad—kind of like having one last romp in the sack before parting ways. But Blakeslee, I don’t want you drilling me and splitting. The pamphlet Blakeslee sent out focuses on the environmental benefits of oil drilling, but not the actual project. I’m confused, too. There’s a picture of a cute little girl in front of a lush redwood tree, and a cute little girl blowing a dandelion seed, and a picturesque egret in a marsh. They must’ve wiped the oil off the little girls and egret before posing them. The project may also have been the wedge that helped break up the Schwarzenegger and Garamendi team. Then there’s the whole thing about the State Lands Commission rejecting the project and a hoard of Republicans, including Blakeslee and Schwarzenegger, who still want to override that decision. Drill, baby, drill. Right before Halloween, a bunch of people got all dolled up and scuffled around in full zombie makeup at the SLO Farmers Market. It’s a bit of a growing trend in the country. Zombies are such cash machines, the only way they might rake it in more dough would be to combine them with emo vampires. There was another zombie march a few weeks before where the pseudo undead were told beforehand to hold up signs assuring that they weren’t really zombies. Likely story. When the zombie apocalypse does come, they’d probably try to pull something like that. Where’s my katana? During the latest march, there was actual violence—but not the kind you’re thinking. The zombies, aside from scaring children, accidentally bumped someone’s kid. The irate father then slugged the zombie and the situation escalated into a brawl … with zombies. No brains were lost, but the zombies did cover the kid in fake blood. Naturally, dad went a bit apocalyptic. The police came, but there were no arrests, probably because the only description anyone could give was, well, a group of zombies. I heard a few zombies came in to apologize and try to stop the scuffle, but they got clocked, too. I can’t even picture reasonable zombies who want nothing more than to loiter a bit and avoid any violence. What do they mumble? Brains, if it’s OK with you. 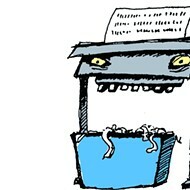 Help start a zombies against violence petition at shredder@newtimesslo.com.